Conandron is a genus that consists of 3 species of small ornamental alpine perennials native to Japan and Taiwan. The botanical name comes from the Greek, meaning “cone-shaped anther”. These plants are almost stemless herbs with radical glabrous, rugose, thick wrinkled leaves in flat tufts with leaves about 6″ long. 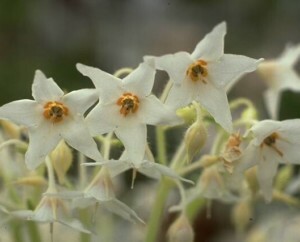 Erect flowering stems emerge from the ground, bearing numerous pretty lilac and white, star-shaped blossoms with bright purple centers in summer.